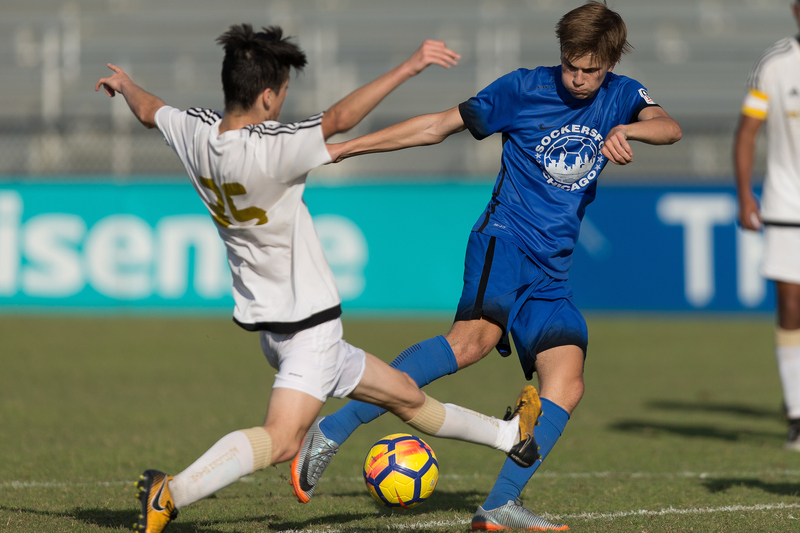 The U-16/17 age group takes center stage on day three of the boys' 2018 U.S. Soccer Development Academy Winter Showcase. Here's a look at the Feature Games that will pit select clubs against one another in match-ups they wouldn't otherwise see through the 10-month Academy regular season. Both games will be streamed through the Development Academy Facebook page and U.S. Soccer YouTube channel. Sockers FC have a high-octane offense with 37 goals in just 11 matches so far this season. Kacper Chrapczynski and Marek Gonda lead the forward line with 11 goals apiece. Currently third in the Mid-America Division, a good showing at the Winter Showcase will have the Illinois club firmly entrenched in the play-off positions heading into the holiday break. Last year's finalists, Atlanta United, are having another fine season. The club sits just three points out of first in the Southeast Division with a game-in-hand over first place United Football Academy. Center-backs Garrison Tubbs and Kobey Stoup will have their hands full with the Sockers' potent forward line, but if they can bunker down, Atlanta United could very well be sitting atop the division table by day's end. D.C. United is a side that likes to build out of the back and attack spaces as they become available. Jacob Greene, Jeremy Garay, Bryang Kayo and Moses Nyeman have all spent time in the Youth National Team set-up. Nyeman will make his first start after a six-month injury lay-off as United faces one of its stiffest test this season. Head coach Ryan Martin has done an excellent job of rotating his players, making sure that almost everyone on the roster has at least one start. The changing of personnel hasn't affected the results as D.C. United sits in second place in the Atlantic Division with eight wins under its belt. Likewise, FC Dallas is having another dominant season with a perfect record after ten matches. The club is averaging over four goals a game and has conceded just three times with seven clean-sheets. David Rodriguez has eight of those goals, but the joy of finding the back of the net is shared by nine different players. At the other end, Seth Wilson and Jack Waterman share the goalkeeping duties. Ty Reynolds (brother of FC Dallas' U-19s and homegrown signing Brian) and Ian Villatoro are up from the '04s for the Winter Showcase. The match vs. United offers them a chance to make their mark for an older age-group against one of the best teams from the East Coast.